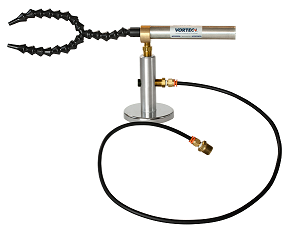 Cold Air Guns use vortex tube technology and filtered compressed air to produce sub-freezing air as low as -30 deg F for numerous industrial spot cooling applications. With no moving parts to wear out, Cold Air Guns require no electricity at the target, just a compressed air source. Be the first to find out about discounts and promotions as well as the latest in our technology. Conditions of Use | Privacy Notice | Copyright © 2019 Vortec.com. All rights reserved.